THE GOVERNMENT HAS not ruled sending an Irish team to investigate the murder of Michaela McAreavey, the Tánaiste Eamon Gilmore indicated last night. He said the possibility of sending a team of investigators to the country was something that may be dealt with “down the line”. His comment came as Fianna Fáil urged the government to send a senior garda to the country. I cannot accept that the printing of these photographs of Michaela could in any circumstance be considered acceptable and shows a total lack of respect to both her memory and the feelings of her family who have already suffered so much. He said that Ireland’s Ambassador to Mauritius, Brendan McMahon, will convey a strong protest to the Mauritian authorities at what appears to be the leaking of the crime scene photos. He will also enquire as to what further actions will be undertaken by the authorities there to investigate the murder of Michaela McAreavey. While we fully respect the court process, and do not wish to do anything that might prejudice any future proceedings, I am very concerned that an urgent examination of the case be undertaken to ensure that justice will be seen to be done for Michael, John and their families. Fianna Fáil Spokesperson on Justice Niall Collins TD has proposed that a senior Garda investigator be sent to Mauritius to review the files relating to the murder of Michaela McAreavey. There are serious questions surrounding the investigation into Michaela McAreavey’s death and I believe that the Irish public would welcome direct intervention by Irish investigators to better understand what has gone wrong. The terrible mismanagement of this case from the beginning has only added to the grief and heartbreak of the Harte and McAreavey families. He asked Justice Minister Alan Shatter to bring this matter to Cabinet today and to discuss with the Garda Commissioner Martin Callinan the possibility of sending a senior Garda investigator to Mauritius to review the case files and meet those involved in the unsuccessful prosecution. At the very least, the involvement of An Garda Síochána would underscore the Irish people’s disgust at the failure of Mauritian authorities to prosecute Michaela’s killer or prevent the defilement of her memory in the Mauritian press. Gilmore said that while the Government “can’t physically prevent the photos ending up on the internet”, he believed that any self-respecting media member, of either traditional or online media, would not publish them. He said that the Government wants to send a “very strong message” to Mauritius, which he described as a “formal government-to-government protest”. 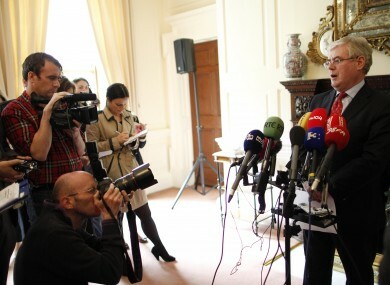 He added that he has spoken directly to John McAreavey, who is believed to be happy with the Government’s approach. When asked if the Government would send its own team of investigators, he said “that is something we may have to look at down the line”. The Tánaiste added that he didn’t think there is any doubt that what has happened to McAreavey “will have considerable consequences for the tourist industry in Mauritius”. Email “Irish investigation into Michaela murder not ruled out”. Feedback on “Irish investigation into Michaela murder not ruled out”.